We are supposed to beat Buffalo - and we are supposed to win the back-to-back games against Toronto over the next four days. This is supposed to be the rally for points to the playoffs, before we start playing competitive Atlantic Division rival games...THIS IS SUPPOSED TO BE PLAYOFF HOCKEY, JERKIES! 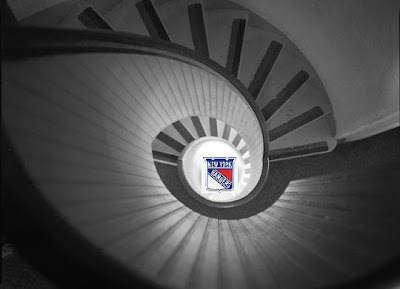 The Blueshirts lost again. Blah, blah, blah. Tom Renney. Blah, Blah, Blah. Glen Sather. Blah Blah, Blah. Buffalo goalkeeper Ryan Miller stopped every Ranger shot, until he was taken out by our 'now looking to fight' Scott Gomez. Shortly after during the third period, our Blueshirts rallied back to a (w)hole 2 goals, scored by frustrated Marcus Naslund and rookie Nigel Dawes. The Rangers dropped to 2-7-2 in their past 11 games, and are winless in their past eight on the road (0-7-1) since a 3-2 overtime win at Chicago on Jan. 16. New York has been outscored 31-8 during its road slump. Aside from a couple of games in hand for the following teams, the Rangers have the same number of points as the Buffalo Sabres and the Florida Panthers -- occupying the final three slots of playoff consideration in the Eastern Conference. Woh! A far cry from October! P.S. To not entirely piss off the New York Rangers fan base, rumor on the street is that Glen Sather is considering raising Darius Kasparitus number next season. At least THAT FICTION would give us something to look forward to. glad I was at an exciting sporting event, boys H.S. basketball playoffs... missed the joke that is the Rangers. I knew that the win against the Islanders was a fluke. Oh, well there's always five years from now! Oh, and can Renney please just not comment, me thinks he's really on some of that Montreal dope! IT WAS ATROCIOUS. You should call yourself THE DARKER & DARKER RANGER. HA HA. Gotta love how that idiot tool of a coach feels free to totally ignore the facts and spill the first vague comment that overruns his lip. "duh...duh ..duh.. effort fine.. duh .. battle level... uh .. tight group... cant comment on that... duh... (insert random long dictionary word here)hockey will win games..."
That stick he got hit with in Columbus must of done some permanent damage. Someone take the remaining money under the cap and use it to buy Renney a clue.